Lovat extended their unbeaten run for the season into its first knockout action with a 4-1 home success over Kinlochshiel in the MacTavish Cup. That was also the scoreline in the all-National Division encounter between Skye and Fort William while Caberfeidh edged Lochaber 3-2 in the day's other tie. Lovat also remain top of the Premiership despite a 5-1 success for Kingussie in their game in hand at Inveraray. Meanwhile, Kyles Athletic took both points with a 2-0 victory at Kilmallie. 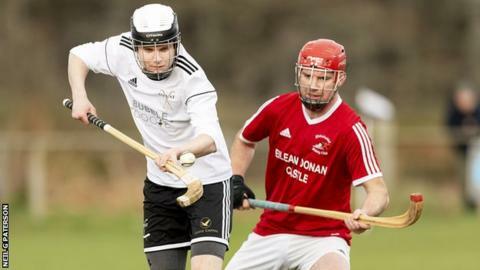 Kinlochshiel, who lost 5-0 to Lovat in the Premiership four weeks previously, went ahead in the first minute through John MacRae and it was the back end of the first half before a Greg Matheson double put Lovat in charge. Marc MacLachlan and Calum MacAulay then finished the job for the Kiltarlity side. In Portree, Jordan Murchison and Iain MacLellan gave Skye a two-goal lead and Fort's Arran MacPhee responded. MacLellan and Murchison scored again within a minute of each other to send the island side through after Fort's Mark Grant had been sent off. Stuart Callison drew first blood for Lochaber before Ryan MacKay and Craig Morrison gave Cabers the lead. Pat Toal equalised in advance of Kevin Bartlett's clincher for Caberfeidh. In the Premiership, Gary MacPherson gave newly-promoted Inveraray an early lead but Roddy Young, followed seconds later by Ruaraidh Anderson, edged Kingussie in front. Savio Genini made it 3-1 just before half-time and later completed his hat-trick. An early and a late goal from Ross MacRae sealed the points to put Kyles third above hosts Kilmallie. In the National Division, Ally MacKerracher scored four, including a hat-trick in 14 first-half minutes, as Oban Celtic edged Bute by the odd goal in nine in a game that Bute had briefly led 4-3. Connor Golabek equalised for Glenurquhart in their 1-1 draw away to Glasgow Mid Argyll, whose Calum McLay had scored the opener. Ballachulish won 3-2 at Col Glen in the Glasgow Celtic Society Cup.